Do Armadillos Make Good Pets? While they are endearing animals, armadillos present several distinct husbandry challenges that make their captive care unreasonably difficult for the average person. Armadillos require large living spaces. They are nocturnal, secretive animals who require a diet rich in live insects. Additionally, as armadillos are not well established in the pet trade, it is difficult to find healthy specimens -- that's an important consideration with captive animals who can carry zoonotic diseases. Many states and municipalities prohibit citizens from keeping armadillos as pets; others restrict armadillo ownership to rehabilitators, educators and other professionals. However, even they face a number of other challenges. For example, it will likely be difficult to secure the services of a veterinarian comfortable with, and qualified to treat, armadillos. Additionally, aside from humans, armadillos are the only known species that can harbor Mycobacterium leprae – the bacterium that causes leprosy. One of the greatest challenges in keeping armadillos as pets is their space requirements. In the wild, armadillos forage over relatively large areas -- their mean home-range size is more than 21 acres. For the sake of health and hygiene, you must not allow your pet to roam about freely in your home. This means that the best type of cage to provide your armadillo with is the largest outdoor pen you can reasonably construct. While breeding males avoid each other and should not be housed together in captivity, females, non-breeding males and young armadillos often have overlapping home ranges, so they may coexist peacefully in suitably large habitats. Once you identify a suitable space for your pet, you must overcome the challenges associated with containing him inside some sort of enclosure. Chain-link fencing is one of the best options, although it must extend at least 12 inches below ground, as armadillos are prodigious diggers who may easily excavate below barriers. Poured cement or stacked block walls are suitable alternatives, but they also require subterranean fortification. Additionally, as armadillos are skilled climbers, their enclosures must have secure roofs or lids. Different species of armadillos live in different climates and have different temperature requirements. As you should keep armadillos outdoors, you must live in an area with a climate that's comparable to your pet's home range. Because of their low body temperature, armadillos can develop frostbite easily, so they require well-insulated retreats if your local temperatures drop below freezing. The dietary requirements of armadillos are poorly understood, which presents additional challenges to keepers. In the wild, armadillos are primarily insectivorous; although they also consume small plants, worms, mollusks and other tiny creatures they encounter on their nightly feeding forays. If you decide to keep an armadillo as a pet, try to feed him a wide variety of inoffensive insects, invertebrates, berries, fruits and small bits of dark green leafy vegetables. Additionally, you can offer your shelled-pet small quantities of lowfat cat food, if you wish. Feed an armadillo daily, in the late afternoon or evening. It is imperative that you work with your veterinarian to ensure you provide a balanced diet. If you are prepared to bring an armadillo into your life, you will face the problem of acquiring the actual animal. While captive-bred specimens are usually healthy and therefore superior to wild caught specimens, who are more likely to carry pathogens or parasites, they are difficult to find. Most specimens offered for sale are wild caught. 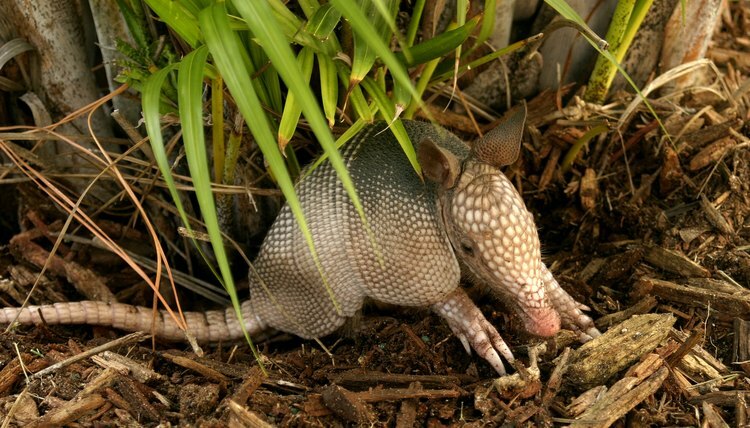 Young armadillos are fragile animals; they have a poor record in captivity. Not only is it wise to purchase captive-bred animals, but you should try to purchase captive bred animals who are at least several months of age. Never take an armadillo from the wild and try to make it a pet; if you are concerned for the creature's safety, take it to a licensed wildlife rehabilitator.